Please click on the relevant Causeway stone or use the Menu buttons to navigate to our service pages, where you will be able to read much more about the separate services we provide. If you already know what you want from us, click on a 'Contact' button to get in touch, we look forward to hearing from you. ﻿For affordable electrical work, you can trust Causeway Security Solutions electricians to get the job done professionally and safely. For a professional and affordable CCTV service, choose a Causeway Security Solutions CCTV technician to install or maintain your CCTV. We will design a system to meet your specific requirements, ensuring quality of camera, recorder and images that deliver the security that you need. Please visit our CCTV page for more information on the CCTV services we deliver; call or click to discuss a quote. Whether it is a simple repair, maintenance or completely new installation, you can trust Causeway Security Solutions burglar alarm engineers to undertake the work professionally and in accordance with strict guidelines, meeting the standards of the police and insurance companies. Please visit our burglar alarm page for more information on the services we deliver; call or click to discuss a quote. For fire detection and alarm maintenance and installation you can trust Causeway Security Solutions fire alarm technicians to meet the very strict guidelines contained in BS 5839. Be assured that advice given will be in accordance with the Fire and Rescue Services (NI) Order 2006 and The Fire Safety Regulations (Northern Ireland) 2010. Please visit our fire detection and alarm page for more information on the services we deliver; call or click to discuss a quote. Causeway Security Solutions is the name you can trust when it comes to access control. From intercoms to electro locks and keyless entry systems, all of our installations comply with BS EN 50133, ensuring quality, safety and security. Please visit our access control page for more information on the services we deliver; call or click to get a quote. Our master locksmith is an expert in mechanical and electric locks, as well as gaining entry to your premises or vehicle in an emergency, we supply and install locks for every type of door and window - and what's more, all of our products meet BS 3621 or the requirements recommended by the police or insurance companies. Please visit our locksmith page for more information on the services we deliver; call or click to discuss a quote. Trust Causeway Security Solutions to help you switch onto digital TV and improve your home entertainment experience. Our trusted aerial and satellite engineers are highly qualified, using quality products and employ the best practices recommended by the Confederation of Aerial Industries. Please visit our digital satellite and aerial reception and distribution page for more information on the services we deliver; call or click to discuss a quote. In addition to delivering a service to meet your electronic security requirements, trust Causeway Security Solutions to advise you about physical security measures. We can survey your property and conduct a risk assessment and provide you with recommendations regarding building security and application of physical security systems. Please visit our Safe, Cabinets and Lockers page for more information on the services we deliver; call or click to discuss a quote. Integrating your electronic and physical security systems through Internet Protocols is a cost efficient and effective way to combat criminal activity. Causeway Security Solutions' technicians can help you realise the benefits of integrating your fire detection and security systems, enable you to have remote (off site) access and control. Please visit our security systems network page for more information on the services we deliver; call or click to discuss a quote. 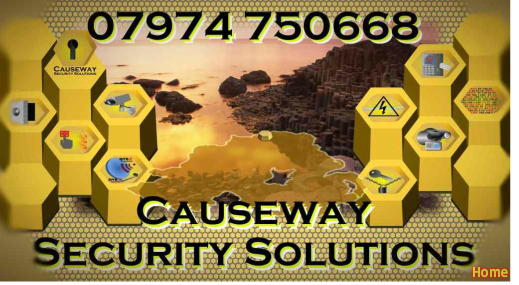 Causeway Security Solutions provides a high quality service to our customers on the Causeway Coast, including Coleraine, Portrush, Portstewart, Bushmills, Limavady, Garvagh, Ballymoney, Dunloy, Loughguile, Cloughmills, Cushendall, Armoy, Ballycastle, Ballybogey, Portballintrea, Dunseverick, Ballintoy, Ballymena, Kilrea and Magilligan. We also travel further afield to our customers in Belfast, Lisburn, Carrickfergus, Bangor, Enniskillen, Moira and Holywood. The chances are we won't be too far away from you. We are willing to travel within reason, so give us a call to discuss your needs, we will be delighted to hear from you.